If your climate requires pool winterization, this article is for you. When do you winterize your pool...September? October? Later? More importantly, how do you leave the water chemistry before putting the winter pool cover on? And do you treat the water throughout the winter? When we ask these questions to the pool service industry, we get a wide range of responses. But overall, it seems like most pool service techs don't come back until it's time to remove the winter pool cover and open the pool for the season. At best, this practice is a missed opportunity; at worst, it's a liability. Pool winterization is something that we as an industry can be much, much better at. If you would like to hear my two cents on the matter, keep reading. The question is this: What is the water chemistry that we leave behind after pool winterization? Are we just following industry standards like usual? You know, range chemistry; the same way you would treat the water during the summer season. As a fellow pool professional--since 1984--I know what I'm about to talk about cuts against the grain. As pool professionals, we have been trained to manage water chemistry by "industry standard ranges". The goal of this concept is to maximize chlorine efficacy and water clarity; our two top priorities when the pool is open. After all, we're managing water people submerge themselves in! Of course it needs to be safe from disease, and of course it should look clean and clear. But where do sanitation and water clarity apply to pool winterization? Are people swimming under the winter pool cover? No. 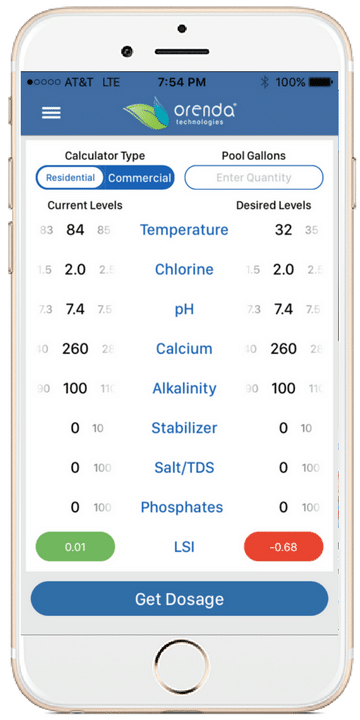 The priority for closed pools should be water balance--based on the saturation index--and then chlorination and water clarity. Just following industry standards after pool winterization is virtually guaranteeing permanent damage to the pool. As the water temperature rises, so too does the sanitizer demand. Not only are living organisms more active in warmer temperatures, but most chemical reactions--in pools, anyway--occur faster in warmer water too. Below 55ºF, sanitizer demand is much less than say, 85ºF. I say this from personal experience. We cannot ignore sanitation below 55º, but let's be honest. Keeping a pool algae-free in the winter is much easier than in the summer. I'm here to tell you that temperature is a major reason why. As water temperature declines, so too does the speed of chemical reactions. Take for example an Orenda product like CV-600 enzyme. Enzymes are reactive beginning at approximately 65ºF. Below 65, they slow down and go dormant. It is also difficult to dissolve chemicals like calcium or sodium bicarb in cold water. Have you ever noticed that? I have. Undissolved calcium thrown into the pool, and the operator left. This photo was taken one week later. 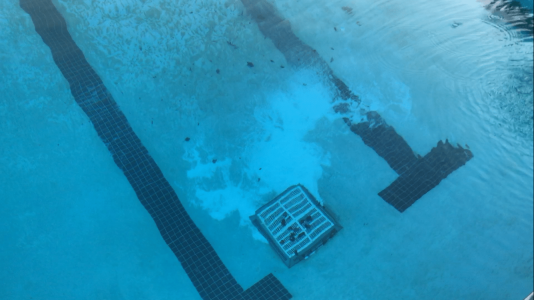 So let's take water temperature into primary consideration for pool winterization. We should always pre-dissolve and circulate dry chemicals when the water is still warm enough to do so. If you need to add calcium or bicarb to prepare your water's LSI for pool winterization, do so weeks before closing when the water is warmer. Ensure full mixing occurs and no undissolved material stays on the pool floor. Calcium, for example, can damage a pool surface if left on it directly for extended periods of time. I suggest that phosphate treatments occur weeks before pool winterization for two reasons. First and foremost, give the reaction time to complete, and clean up the precipitate. Secondly, related to temperature above, the reaction will be slower in cold water. The same goes for using SC-1000 or any other type of sequest or chelant. It is a common industry practice to add sequest during pool winterization. I question this practice due to water temperature. In our experience, SC-1000 is better applied in the spring during pool openings rather than pool winterization. When you use the Orenda LSI Calculator, adjust the temperature dial down to winter temperatures. You should notice a problem. See how the LSI goes down? The same "industry standard" water chemistry ranges will not protect your pool in the winter. In fact, it virtually guarantees severe surface damage over time...regardless of what type of pool you have. Water is relentless in its demand for equilibrium. Since we have established that water temperature is such a critical factor in the LSI...why are we closing pools in September? If we are just a bit more patient with pool closings, the water will be closer to its winter temperature. If you wait too long, the water will be too cold (as discussed in detail above), but find a time that works for you. Stretch that season a few more weeks, and I believe it will benefit the customer and your service company. We have come to witness a big problem in colder climates: calcium crystals. These crystals form on cement surfaces like plaster and tile grout. So many people thought this was scale, but in fact, it's the opposite problem of scale. These crystals form in very low LSI, cold water. These calcium crystals are an extreme form of etching...you can literally see how much calcium has been extracted from your pool surface or grout. Treating them with acid is the exact opposite of what should be done, because it lowers the LSI further. Fortunately, we have had tremendous success in solving this problem. Purge the pool with 32oz of SC-1000 per 10,000 gallons of water. SC-1000's 10.8 pH does not lower the LSI, it actually helps raise it. Continue using SC-1000 weekly and maintaining LSI balanced water until the crystals are gone. Preventative care beats repetitive repair. Add calcium if your pools suffer this crystalline problem. If you have these calcium crystals, it means your water is hungry for calcium and low on the LSI. We recommend 400ppm calcium to give you some grace. After all, it makes more sense to adjust constant factors (like calcium) before fluctuating ones (like pH). Consider extending the pool season into October if you can. It gives the pool more time to be used, and less time to be closed. It improves pool ownership value and can increase service company revenue too. 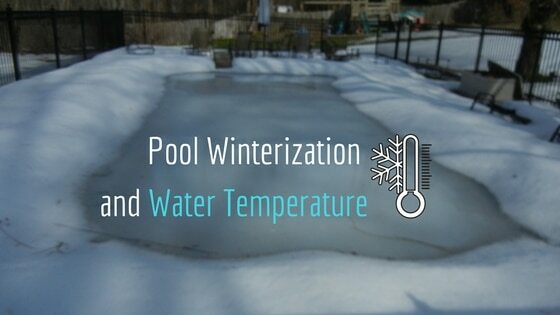 Cold water is the factor we have to adjust for in pool winterization. It slows chemistry, lowers sanitizer demand, and most importantly, lowers the LSI. Remove phosphates at least a week before pool winterization so you have time to come back and vacuum, and clean the filter. Purge with CV-600 when the water is still above 65ºF. It is very helpful to do a deep clean of the inside of the pipes before clearing the lines and lowering the water level. Do not over-chlorinate at the end of the season. 3-5ppm should be plenty, as the sanitizer demand is only decreasing as the temperature drops. Besides, nobody is swimming under the pool cover. If you winterize pools, we recommend 400ppm calcium. Use the Orenda LSI calculator to manage it. You will find it's a valuable ally, especially in the winter. For more information or specific questions, contact us. Thank you for your time.